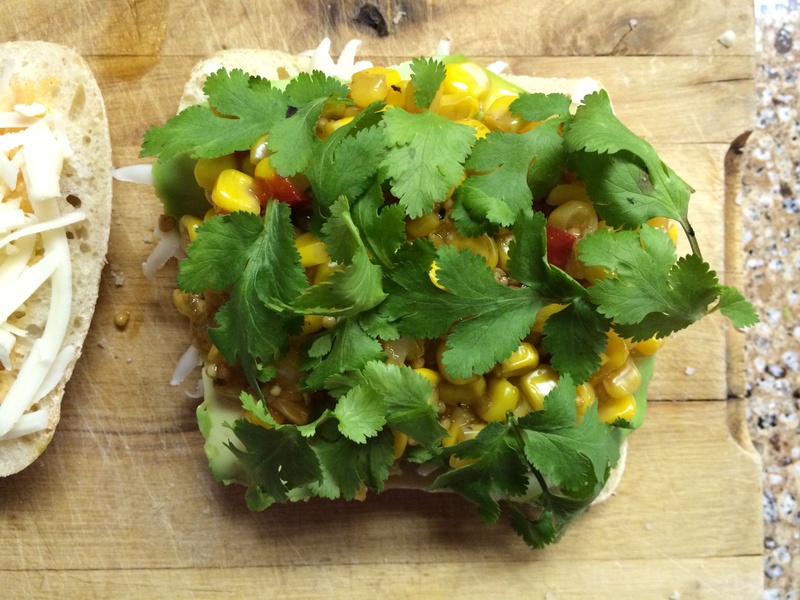 Grilled monterey jack cheese with homemade chipotle mayo, avocado, corn relish, and fresh cilantro on a Portugese bun. 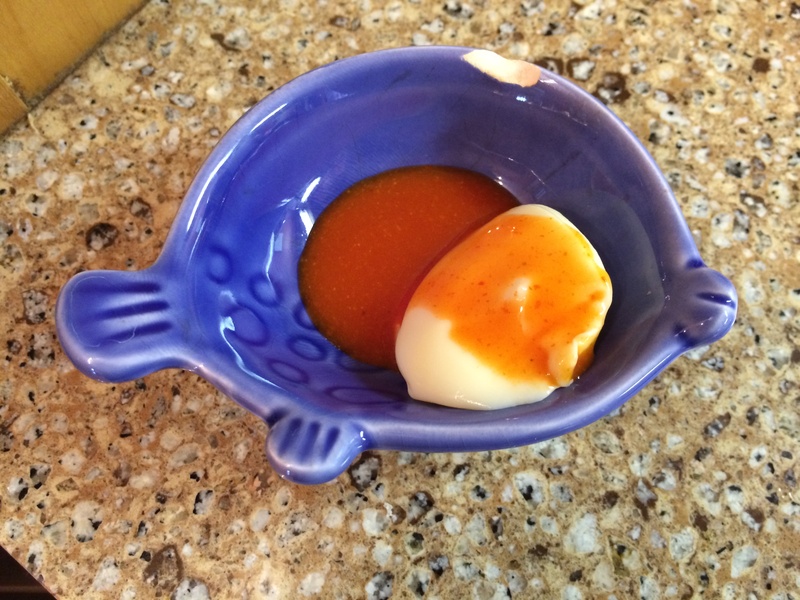 I saw this recipe on one of my favorite fellow food blogger’s web sites (which she had reposted from another food blogger’s web site) about 5 months ago and I knew I had to try it, but it took me a while to get around to it. I finally got the ingredients together and made this sandwich for myself and a friend last week. It was absolutely fabulous–so addictive, in fact, that I have made it two more times since then! 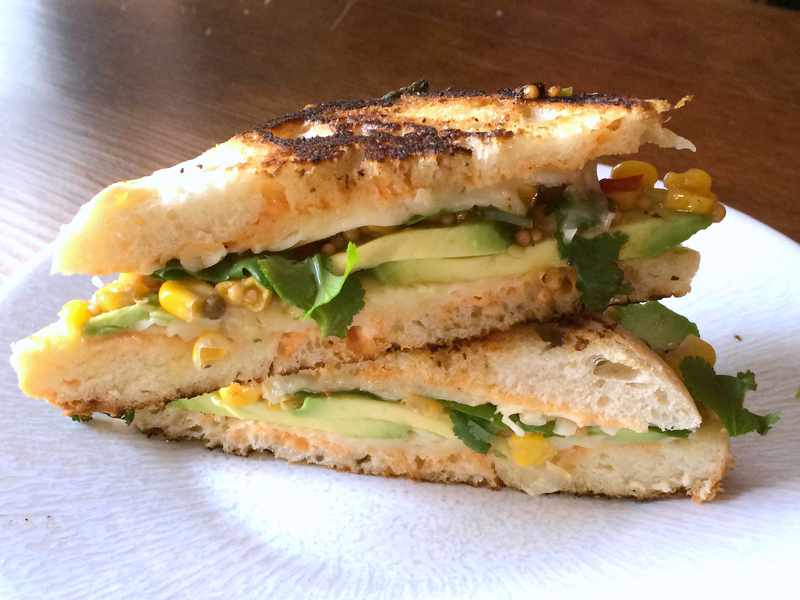 Soft, mild monterey jack cheese is the perfect choice for this sandwich, as it doesn’t fight with all the other delicious flavors going on–spicy chipotle mayo, sweet corn relish, fresh cilantro, and the mild flavor of the avocado. I was a little concerned about grilling this with the avocado already in it (who wants hot avocado?) 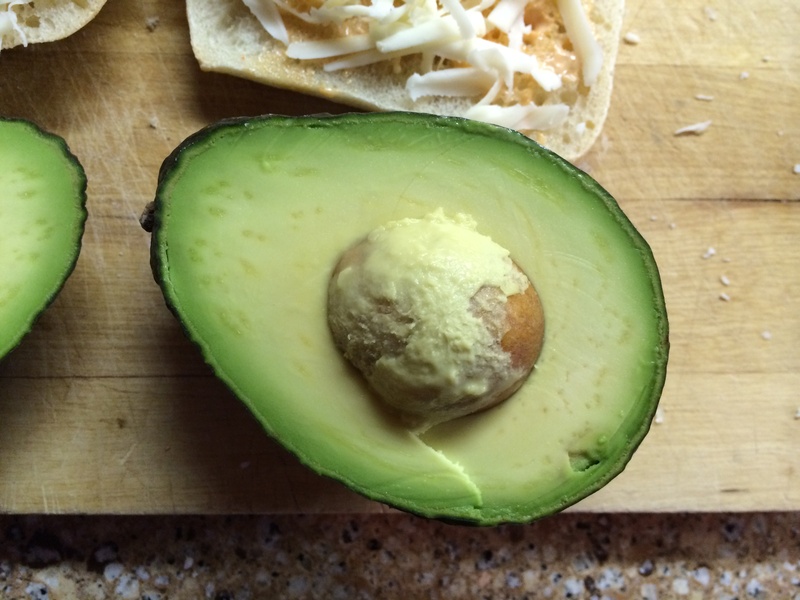 but if you grill it a little on both sides until the bread is nice and toasty and the cheese is just melted enough to hold the whole thing together, the avocado and cilantro will remain in their natural state. The corn adds a lovely sweetness that complements the spicy mayo and fresh cilantro, and the avocado adds a surprisingly delicious creamy component to the sandwich that I wouldn’t have thought would be good on a grilled cheese–but it works deliciously well with the crunchy, toasty bun and melted cheese. I used Portugese buns with the top and bottom shaved off, but I can see this working well with a variety of breads. I substituted Chalula (my hot sauce of choice) in place of the liquid from the hot peppers, as I didn’t want to open a can just to use the juice. It was delicious and added a nice color. I’m sure any hot sauce would work well. I used Trader Joe’s Corn Relish, which I think would taste good on anything. The recipe recommends grilling the sandwich in the chipotle mayo, but I added some butter to the skillet to make it a little crispier (and more fattening – hehe). 1. Slice the top and bottom off of a Portugese bun (I strongly suggest doing this step as it ensures that the sandwich grills well and is not too bready) and mix a generous spoonful of mayonnaise with a few shakes of your favorite hot sauce. 2. Spread chipotle mayo on both sides of the roll, then put a generous handful of grated monterey jack on one of the sides. Top this with avocado slices, a couple spoonfuls of the corn relish, and as many cilantro leaves as you like. Finish with more grated monterey jack cheese and close the sandwich. 3. 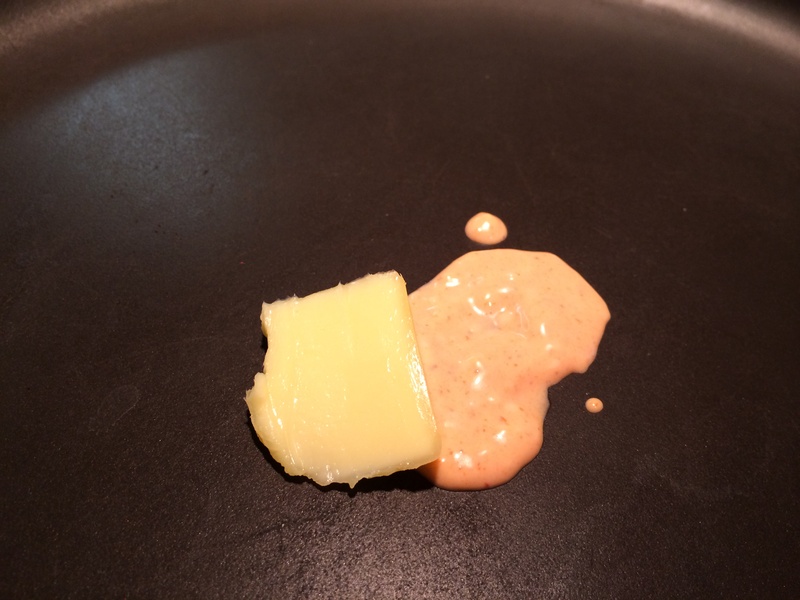 Melt the remaining chipotle mayo and a pad of butter on a skillet, then grill the sandwich on each side for a few minutes until the cheese is melted. Press with the back of a spatula, then remove and let sit for a moment before cutting (to ensure that the sandwich holds together). 4. Cut, serve, and eat! I’m doing to have to make this very soon! My mouth is watering! Can’t wait to try this! It is a really delicious sandwich. And as sinful as it is with all that fat, I love that there are plenty of veggies in there too.